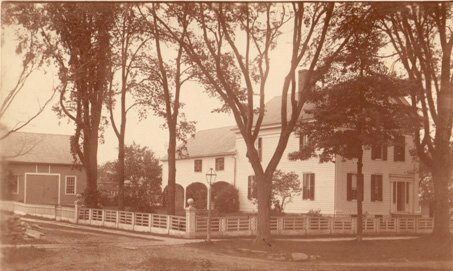 In 1810, Benjamin Raymond built his home on his 508 acre farm which was that part of Potsdam lying east of Market Street and north of Elm Street. The house was a one-story white wooden structure, U-shaped, the main part 64’ x 16’ with two wings to the south, each 17’ x 19’. A garden filled the open space between the wings. In 1818, when Mr. Raymond resigned as land-agent and moved to Raymondville, he sold his farm back to the Clarkson Proprietors. John C. Clarkson, who came to Potsdam at that time to take over Mr. Raymond’s duties, lived in the house while he was building his own on Elm Street. The house was then sold to Hermon LeRoy, one of the Proprietors (hence Leroy Street) and then to David L. Clarkson. This house burned and David L. Clarkson built the stone house about 1836 (at present the Merritt Apt.). 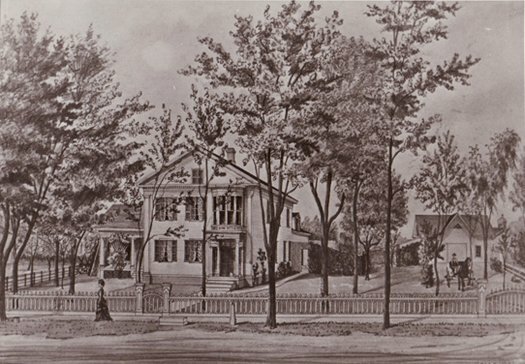 In 1811, Liberty Knowles, who married Melinda Raymond, built the first two-story house in Potsdam. 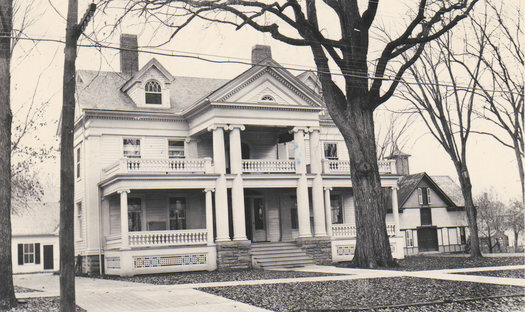 It was a beautiful colonial type house on Market Street opposite Depot Street and was last owned by Mr. Ives. It was torn down to build the present Kaplan Block. In 1821, Sewall Raymond and Liberty Knowles built the store at the corner of Market and Elm Streets of Potsdam sandstone, in the old slab and binder type of stonework. This was an experiment to decide whether it was practical stone for building purposes. In 1823, John M. Call built the first residence of Potsdam sandstone. This is the present Elks Club. Mr. Call was the grandfather of Harriet Call Burnap, who with her husband gave the Potsdam Museum its collection of English Pottery, and of Helen Call who also sent many items to the Museum including her collection of early pewter. 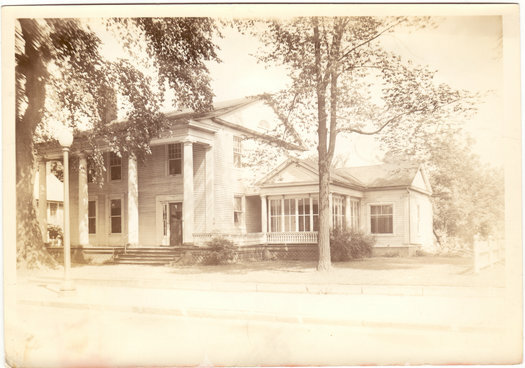 The house was purchased by Bloomfield Usher in 1854 and it became the Potsdam Club in 1895. In 1960, the building was sold to the Potsdam Elks Club. The “Moon” house at 29 Pierrepont Avenue was built in 1825 by John Smith who came to Potsdam in 1816. It was the first house “to be raised in Potsdam without liquor”. A tannery belonging to him stood just north of the house. John Smith had two sons, Truman and Justus, who opened the first bookstore. They sold to Mr. Seeley who sold to J.R. Weston. Weston’s Bookstore was given by Murray Walker to Clarkson College in 1963. Sewell Raymond, a cousin of Benjamin Raymond, built his white frame house in Greek Revival style in 1813. 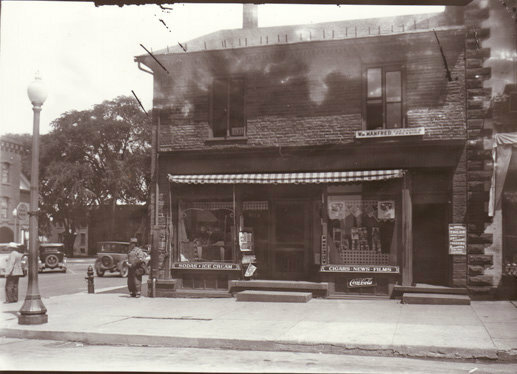 It stood at the corner of Elm and Union Streets until 1937 when it was moved back to Union Street and the Shell Gas Station was built. Today the Raymond house contains apartments. The house at 35 Main Street where Harley Sackett lives was the Methodist parsonage in 1836. The Lenney house, 29 Bay Street, was built by Mr. Tambling and later purchased by the Presbyterian Church for a parsonage. It was occupied by the Rev. Mr. Hotchkiss and Dr. E.W. Plumb. Triangle Fraternity occupies this house today. 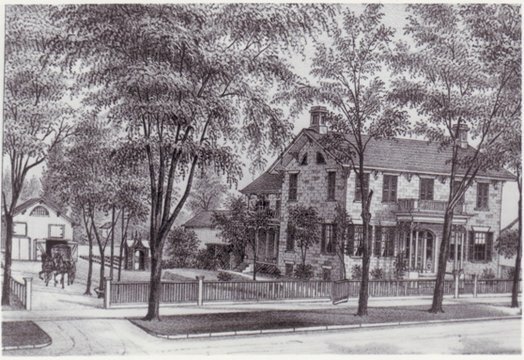 The Pert House, 16 Elm Street, now home and office of R. E.S. 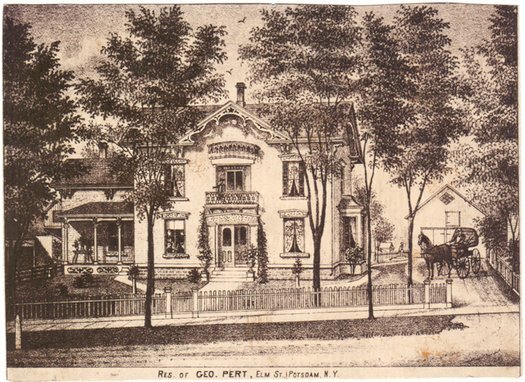 Prescott, was built in 1863 by George Pert. It is constructed of brick, in the Italianate style. 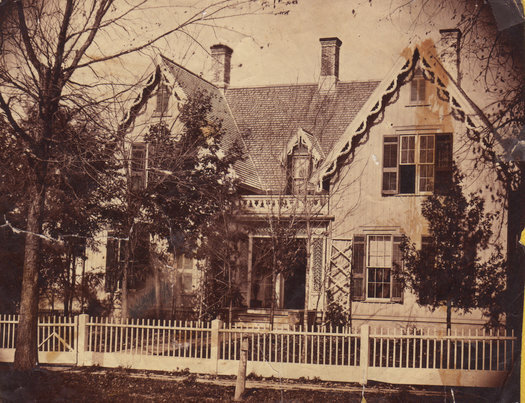 Judge Henry Knowles, eldest son of Liberty Knowles, one of Potsdam’s first settlers, built his Greek Revival frame house at 48 Elm Street in 1842. Judge Knowles was St. Lawrence County judge and a noted attorney. Dr. Helen Hosmer resided in this home until her death. The three Sisson homes are now fraternity houses. George Wing Sisson founded the Racquette River Paper Company in the 1890s and had much lumbering interests. The paper company was sold to Nekoosa-Edwards Paper Company in the 1950s. 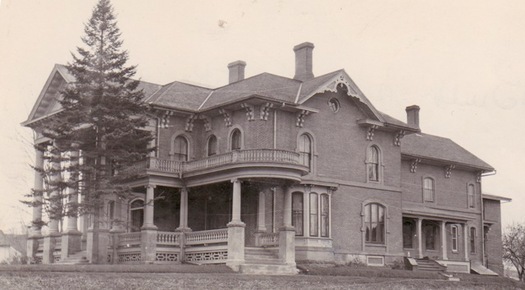 The Sisson Farm on outer Sisson Street was built in the 1890s by George W. Sisson, Jr. The house at 14 Leroy was built in 1864 by Henry Watkins and when George W. Sisson, Sr. purchased it in 1903, he remodeled it and added the portico. The house at 53 Elm Street was built in the 1890s by Rufus L. Sisson, son of George Wing, Sr., and was later home of Walter Sisson. There are several Gothic Revival homes in Potsdam including the one at 46 Elm Street, built by E.W. Foster in 1852.